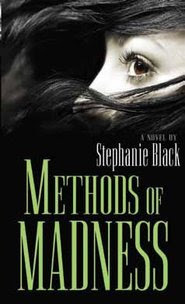 Methods of Madness by Stephanie Black is very suspenseful and keeps the reader guessing until the last few pages. It has been three years since Emily Ramsey's sister was killed and her fiance disappeared. She is now engaged and trying to move on, but still suffers from sadness due to the loss of those 2 important people. She keeps having the feeling that she will lose her new fiance, Zach. Then Zach's ex-girlfriend, Monica, begins to show interest in him again. Emily gets a troubling note, a bloody photograph, and begins finding strange objects in her apartment. Part of her thinks she's going crazy and then someone is murdered. Everyone is a suspect-Zach, Emily's friends, someone from the past. Emily even begins to doubt herself. She doesn't know who to trust and feels that she, herself, is in danger. The book kept me guessing the whole time. I had suspicions, kept thinking one person did it and then my opinion would change. Black expertly weaved clues throughout the whole book, and I doubt anyone was able to figure out the ending. All of the evidence and clues came together in the end to create a thrilling conclusion. I highly recommend this book, but make time for it because you won't want to put it down until you figure out who did what. And, trust me, you will not be able to figure it out. Each character is vividly portrayed unique. I really love the cover and think that it adds to the intrigue of the book. Is Stephanie Black one of the author's you've met? Oh I love those psychological thrillers, where people think they are going crazy....such a great suspense technique! I didn't realize that Stephanie Black had a new title out. I've been wanting to read Fool Me Twice Have you read it? Which one did you like out better? It was very good. I haven't met Stephanie Black, but she is a member of the author's group I belong to- LDStorymakers. Julie- I have read Fool Me Twice. It was also very good. They're both good. I think Methods of Madness was a little more hard to figure out and so a little more susepenseful, but both great reads. Marcia, thank you so much for the great review! I'm delighted that you enjoyed it! You're welcome, Stephanie. It was really good. You could say you 'fooled me twice' because you had me until the very end-twice!